The protests were part of the Fight for $15 minimum wage campaign. 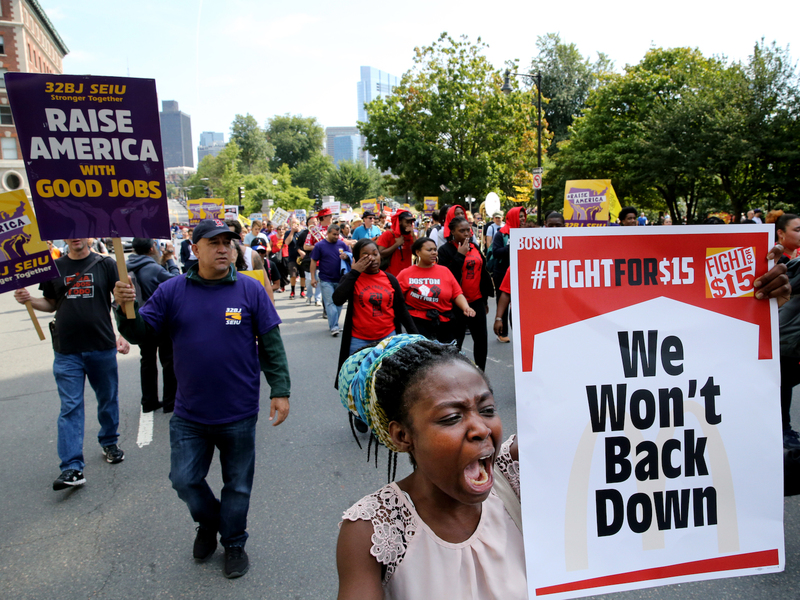 On Labor Day, fast food workers held demonstrations across the country demanding higher wages and unions. The peaceful protests were part of the Fight for $15 campaign. Workers, including those employed at hospitals, day career centers, and teachers, gathered in Boston, Detroit, Phoenix, Orlando, and as many as 300 other cities. Some cities and states, including Seattle, California, and New York have all passed laws raising the minimum wage (and as Food & Wine has reported, the jury is still out on whether or not it will reduce the overall number of restaurant jobs available to workers, in Seattle at least). Regardless of how such laws are faring in other states, Nancy Pelosi has promised that if the Democrats retake the house in 2018, they will pass a nation-wide $15 minimum wage bill, as Grubstreet reports. A statement from the Fight for $15 movement said that the protestors were taking two the streets, walking out of their jobs at places like McDonald’s and Burger King, rallying around chants of “If we don’t get it, shut it down!” and “We’re fired up, can’t take it no more,” in order to demand that unions for fast food workers are also established. Unions would be “the best way to fix the economic and political systems that have been rigged,” according to Fight for $15 organizers. Rev. William Barber, who marched with workers in Chicago, where the minimum wage will raise to $12 next summer, said that he and his fellow protesters were “fighting for the soul" for the country, according to DNAinfo. The Fight for $15 campaign has been in motion since it began holding demonstrations in 2014, but now they are finally beginning to see results as more and more states consider raising the minimum wage.